If you're looking for a stylish and convenient way to recharge your 3DS LL ,3DS, DSi, or DSi XL while organizing games, styluses, and managing content between SD cards and your computer, then we've got just what you're looking for. FirstSing Digital introduces the Multifunction Charge Station for the Nintendo 3DS, DSi, or DSi XL. 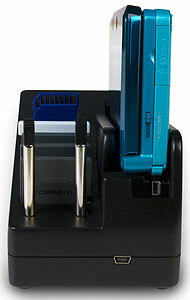 Transferring music from your computer to your 3DS has never been easier with the Multifunction Charge Station's SD card reader, which can read cards and transfer content for use on your Nintendo DS. The Multifunction Charge Station works with all three of the latest Nintendo handhelds: the Nintendo 3DS LL ,3DS, DSi, and the DSi XL. Unlike other docks and chargers, the Charge Station is universal and can dock and charge whichever Nintendo portable game console you have--no more annoying searches for the right power cord. It's your all-in-one utility for docking and charging, organizing your games, and managing content. The Charge Station stores 4 games, 2 styluses, and 2 SD cards, so all your handheld essentials are neatly organized, and right where you left them. 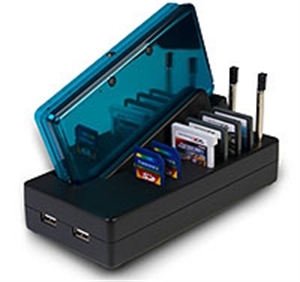 Organize your system, games, and styluses, while charging your 3DS, DSi, or DSi XL console. The Charge Station includes 3 foldable ports to charge multiple DS consoles from a single AC adapter. Use the built-in SD card reader to transfer your music from a computer to your 3DS LL ,3DS, or to move photos from your Nintendo handheld to your computer or laptop. The Charge Station stores any kind of SD card and works as a reader with SD cards up to 32GB capacity, and lets you connect via USB to transfer files. And there are two additional USB slots for more charging options. Universal Media Station for Nintendo 3DS LL ,3DS/DSi/DSi-XL, USB cable, AC adapter, EU adapter, user's manual, warranty. If you're looking for a stylish and convenient way to recharge your 3DS,DSi, or DSi XL while organizing games, styluses, and managing content between SD cards and your computer, then we've got just what you're looking for! FirstSing Digital introduces the Multifunction Charge Station for the Nintendo 3DS,DSi, or DSi XL. Transferring music from your computer to your 3DS has never been easier with the Multifunction Charge Station's SD card reader which works with cards up to 32GB in capacity. You can also save those pictures taken with your handheld console onto your computer. The Charge Station also stores 4 games, 2 styluses, and 2 SD cards (up to 32GB), so all your handheld essentials are neatly organized, and right where you left them.